Hello! Just another non-recipe post about my Ireland adventures. Hope that's okay! If not...um, stop reading, I guess. I'll be back with the foodstuffs soon. Anyway, this past weekend I visited the somewhat mysterious to me land known as Northern Ireland. I went having a vague idea that it was a place filled with tension and divisions, but not much of an impression past that. Northern Ireland is so much more beautiful and complicated than I had ever imagined. Let me show you. Monument on the Catholic/Irish Nationalist side of Derry. Even the name is controversial...loyalists call it Londonderry and nationalists call it Derry. You'll see roadsigns with the London scratched off and vice versa. To this day, the Protestants and Catholics live on opposite sides of the river. A fairly traditional Irish breakfast. Finally got to try black pudding, which was...spicier than I expected. All in all, a delightful and calorie laden way to start the day. Huzzah! 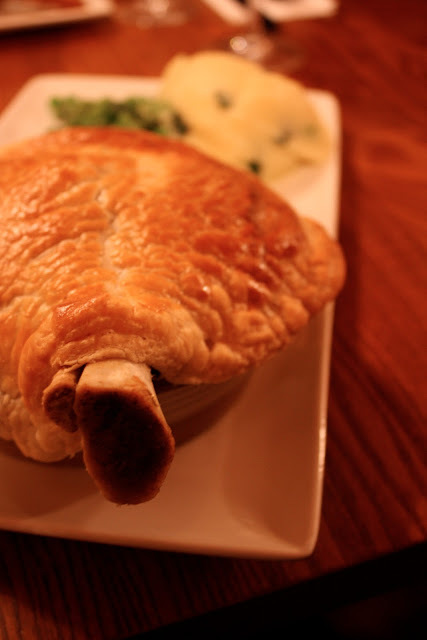 Delicious lamb shank pie at The Crown Bar in Belfast. Meat fell right off the bone. Apparently Anthony Bourdain ate here, which is mildly interesting I suppose. This is where the Titanic was built! I actually had no idea the Titanic was built in Belfast, or how massive it was. It's difficult to conceptualize that. Standing in the bottom made me feel so small. Also, could not stop humming this. The peace wall in Belfast, and me writing a message on it. A wall that separates the Catholics and Protestants. Many believe they're still necessary because of potential violence. Nearby residences have cages over their back gardens to protect them from missiles and other projectiles. I hope that someday all of them can be taken down. It was a truly eye-opening weekend. Whoa. Ireland would be such a dream to visit! And now I want a lamb shank. Shanks for sharing about your adventure! Lawl, you're so punny! You look Irish (red hair! ), you should make a trip.